The empty room in question is the sword training room during the final hours. Normally, you can visit the place to do a sword mini-game and earn a piece of heart. On the Final Day, the teacher will tell you not to fear the moon and that he intends to slice it down. He’ll also kick you out and lock the door to the place shortly before midnight. But when you visit it again after midnight as the ground shakes and the terrifying end-of-the-world music plays, you can enter the place, slice open a sign, and find the teacher cowering in fear. It’s one of many instances in the game that helped make the moon feel like a real threat; you can find how so many characters react to it. It’s especially notable since pretty much everything else in the game is meant to give you a reward of some sort. Over time, the less imaginative part of my brain started to assume that purposeless areas are, like the famous island in GoldenEye, leftovers from unfinished content or underdeveloped because of time and budget constraints. A lot of them probably are. Not every back corner can get full attention. But I’ve also realized that it doesn’t matter how they ended up that way, because like a really great unplanned shot in a movie (like the seagull at the end of Barton Fink), they still add to the feel of the setting. The best example that comes to mind is the museum in Creepy Castle in Donkey Kong 64. Among the other environmental details, there’s a large side room housing a stone pillar. It’s up on a pedestal and has an ominous light over it, and although there are a few bananas in the room to collect, it doesn’t appear to have any purpose at all. Why is it so prominent? Was this part of a goal that never made it into the game? Did it once have something on top of it, at least? Why does an unlabeled piece of stone with seemingly no connection to anything else nearby have its own room? Regardless of what led to its inclusion, that room is a mystery. And unlike all the other interactive details in the museum, the unexplained pillar is an object of genuine intrigue, as a prominent exhibit in a museum should be. It outperforms everything else in the area thematically, and if that was by accident, it shouldn’t make much difference. There’s an item I’ve grown fond of in World Of Warcraft called the Last Relic Of Argus. It’s a Draenei relic you can build through Archaeology that serves only one purpose: It will randomly teleport you to one of several places on the world map. Sometimes it’ll plop you in the middle of an old quest zone full of enemies, which is just kind of annoying, but what’s more fun is when it sends you to some out-of-the-way place you never would have thought to go otherwise that gives you a new perspective on zones you’ve left behind. 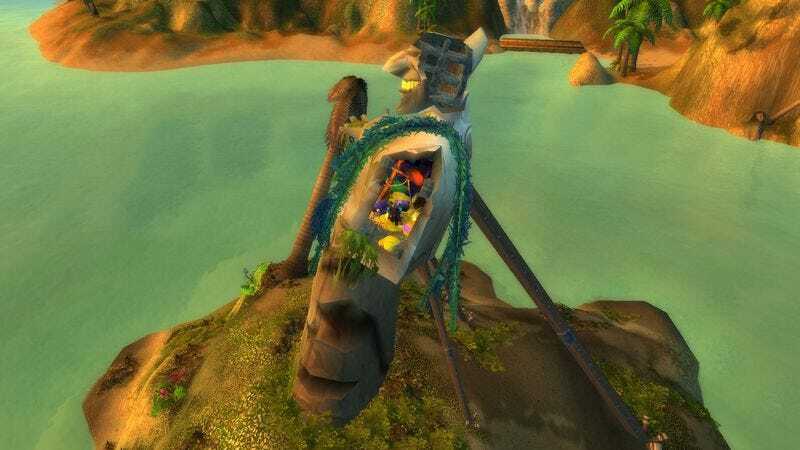 You might end up in a hole in the statue in Booty Bay—and it’s full of treasure! Or perhaps you’ll be standing on a tree branch overlooking a whirlpool, or, my personal favorite, on top of a huge mesa that holds nothing but four skeletons sitting in front of some sort of arcane device. What were they trying to do? Did they succeed or fail? You’ll never know, and you’d never see it unless you had this one mostly useless item. I always like those bits in games, the idiosyncratic details that don’t really need to be there, but hey, something’s got to fill up this world, so why not something whimsical? I loved the way The Stanley Parable plays with the idea of empty rooms. Granted, the whole game satirizes the notion of player choice and “meaningful” play, but the maintenance closet bit devotes a lot of dialogue to really driving home the point. Spoilers ahead, I guess? Initially, you will enter the maintenance closet and the adaptive narrator will pretend as if this was just a momentary diversion in the story. If you continue to stay in the closet, he will disparage you for wasting your time on a room with nothing of interest in it. The narrator becomes more aggravated and desperate the longer you stay there stalling the story (such as it is). At some point, he just assumes that the player fell dead at their computer and asks that whoever discovers the body does the right thing and moves the story forward. Eventually, the game reaches the end of the dialogue for that room. The funny thing is that all the effort they put into the dialogue for that room makes this empty room one of the most interesting and funny bits in the game. When I saw “rooms,” I was thinking about it in a more literal sense rather than “screens” or “squares.” That’s largely because I’ve been playing a lot of games that are very much defined by their emptiness. Primarily, I’ve been spending time with The Last Of Us: Remastered, which is one of the most physically empty action games you’ll find. Especially on Grounded Mode—where supplies are less prevalent and the HUD is disabled—every inch of the game screams about a world that has been lived in and everything has moved past. Every wall and table and object has a history there for the reading, and it’s all so tragic that you have to teach yourself to ignore the endemic horror. Also, the very nature of the game (the secret MVP of which is the sound mixing) makes the player question whether or not the room is empty at all. Some say that these rooms are needed to create a space in between the action set-pieces, and that’s true, but TLOU has an almost relentless march to it, and the stealth portions and gunfights are the cathartic release from the rising tension created by that very emptiness. I have a semi-theory that Dracula’s castle in SOTN is a sort of mocking microcosm of humanity. The themed areas represent many different forms of human endeavor (scholarship, spirituality, sport) twisted into surreal violence. It’s installation art, in a sense; it’s humanity’s underbelly with a frame around it. The library, a place of learning, is revealed as being motivated by quests for power; the arena is a paean to humanity’s boundless thirst for blood (be careful about judging vampires for their appetites); the chapel is an intriguing mirror of religion, where contemplation and salvation are cast aside in favor of holy terrors and strictures. I don’t know if any of that’s intended, but it’s how I tend to read it.